President Donald Trump’s workday on Thursday included two actual things. That day officially began at 11 a.m., per his public schedule, when Trump received his daily intelligence briefing. There’s no telling how long this takes, as Trump famously likes his briefings short and colorful and chart-based; there is no reason to believe that this briefing was anything other than someone showing Trump a video of Lou Dobbs chortling through a 20-second clip of a skateboarding bulldog. At 12:30 p.m., Trump left for Andrews Air Force Base and the short flight that would take him to the only other thing he would do today, which is attending “a roundtable on tax reform” in White Sulphur Springs, West Virginia. As with Trump’s briefing, this could be anything at all but usually winds up being the same thing every time—Trump sitting at a table surrounded by a passel of divorce-collecting local swells who take turns thanking him for his leadership and asking him if he’s lost weight. The president will be back at the White House by 5 p.m., and give or take a DVR’ed episode of Access Hollywood will be done for the day. It is a day seemingly designed specifically not to make any news. And yet. What are we seeing, here? Is this what happens if you leave one of those Norfin Troll pencil toppers in front of a speaker blaring Sean Hannity’s radio show for 18 months? 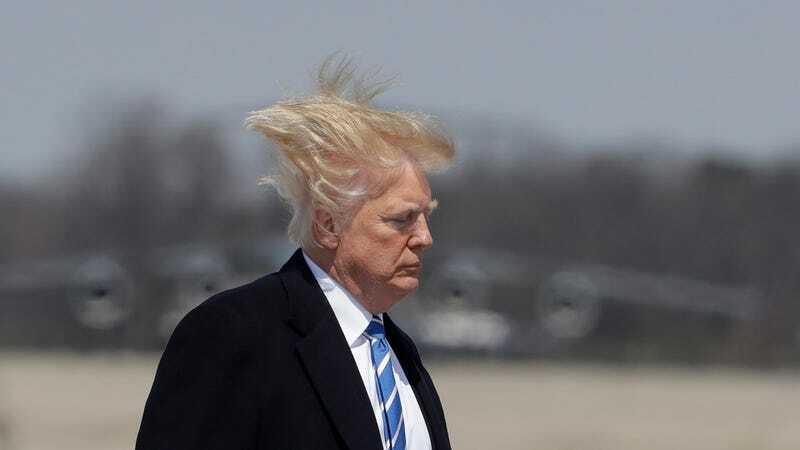 Is this, at long last, conclusive evidence that Trump has precisely five strands of hair growing out of his head, each of which is roughly five inches wide and 28 inches in length? All good and fair questions, but the answer is that it’s none of those things. It’s normal. It’s the President of the United States on a Thursday.